In Rocky, Sylvester Stallone sent boxers sprawling to the canvas. In Rambo, he killed every dictator. In Judge Dredd, he brought every criminal to justice. But Stallone’s most impressive power occurs in The Expendables 3, where he makes Jason Statham, Dolph Lungren, Randy Couture and Terry Crews disappear and replaces them with some dudes named Kellen Lutz, Victor Ortiz and Glen Powell. Call it the ultimate bait and switch: Take three of the staples of the first two Expendables and have Stallone fire them because they’re basically too old to be running around with machine guns and have him hire a few younger, sexier mercenaries to lead. Stallone is 68, so who’s he to tell anyone how old is too old? Expendables 3 could have been epic. Harrison Ford, Wesley Snipes, Antonio Banderas and Mel Gibson joined a cast that already boasted Arnold Schwarzenegger and all of the aging, star-studded mercenaries from Stallone’s crew. It wasn’t a matter of how many bad guys were going to die, but the amount of gore that would be involved in their demises. It wasn’t a matter of how many buildings were going to get blown up, but how much C-4 would be used. But here’s what happened in the two years since The Expendables 2: The stars got soft in their older age – really, really soft. Somehow, the decision was made to drop The Expendables 3 from R to PG-13, which is like serving the audience fat-free frozen yogurt after indulging it with ice cream for years. What’s the point showcasing Lee Christmas’ (Statham) knife skills if there’s no blood spatter? What’s the point of firing massive machine guns if no limbs are lost? Sure, The Expendables 3 can attract a wider audience with a more kid-friendly rating, but when was the last time you went to see a Stallone movie solely because of its story? 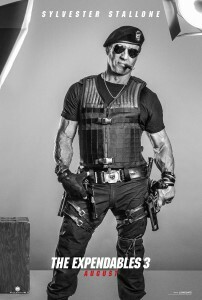 The first two “Expendables’“ biggest strength was the chemistry it developed between Stallone’s character, Barney Ross, and Gunner Jensen (Lundgren), Ceasar (Crews), Toll Road (Couture) and especially, Christmas. This time around, after Stallone and Co. spend the opening scene breaking Doctor Death – a knife-wielding killer played brilliantly by Wesley Snipes – out of a train bound for prison, Stallone basically tells his crew that they are too old and slow and he doesn’t want their imminent deaths on his hands. And just like that, any chance to delve deeper into their relationships is severed. Out with the old, in with the new, as Stallone uses the help of a rogue CIA agent played by Harrison Ford to recruit a new team to go after Conrad Stonebanks, the diabolical bad guy played by Mel Gibson who’s the world’s most notorious weapons trafficker. There simply isn’t enough time in the 126-minute film for the audience to fall in love with Lutz, Ortiz or Powell, who were cast more for their looks and physique than acting skills. Leave it to UFC champion Ronda Rousey, who place Luna, and Antonio Banderas, 54, who hasn’t been this in shape for a movie since donning the Zorro mask in 1998, to uplift a mostly downtrodden film. Yes, I know: The Expendables 3 was billed as the trilogy’s final chapter. But do you really believe that? Can Lions Gate Entertainment Corp. potentially leave hundreds of millions on the table? The first Expendables, which opened in August 2010, made $274 million worldwide ($103 domestically) on an $80 million budget, making it a major success by any standard, even if it received mixed-reviews. Two years later, The Expendables 2 generated $305 million worldwide ($85 million domestically) on a $100 million budget, so did you really not think there wouldn’t be Expendables 3? Of course not. 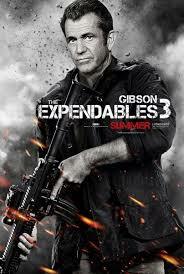 But the box-office numbers for The Expendables 3 could be much lower than its predecessors. At least 2.2 million people already have watched it after a DVD-quality digital copy was stolen and put online weeks before the film’s Aug. 15 release, Robert Wenokur, Lions Gate’s top counter-piracy executive, told The Wall Street Journal. Lions Gate has filed lawsuits against websites linked to pirated copies, which could decrease the movie’s box-office take by an average 19 percent, according to findings by researchers at Carnegie Mellon University. The biggest problem here, however, is the film itself. Director Patrick Hughes doesn’t deliver what Stallone and Simon West accomplished as directors in the first two Expendables, respectively. The PG-13 clearly handcuffs Hughes, as the tone-downed fight scenes will frustrate fans of previous Expendables. Instead of finding the fountain of youth, Expendables 3, like much of its cast, didn’t get better with time – just older, slower and a lot less fun to be around.